Clean-freak college student Dani Hashelheim never imagined she’d discover her latent magical ability in, of all places, a bathroom. But when she ducks into the ladies’ room at the library, she’s put in the crossfire between an elderly janitor and a ravenous muck-monster that emerges from the sink. Dani’s previously unknown power manifests in self-defense, and she floods and burns down the library—at the same time. Enter Ben, the janitor, who works for the Cleaners, a supernatural sanitation company that keeps reality tidy and safe…and a company Dani now works for as well, whether she wants to or not. This puts a significant crimp in her dream to attend med school and become a doctor. Nor is Ben happy, since it’s his duty to help Dani adapt to the job and learn to control her chaotic talent before it kills them both. Dani barely has time to try on her new company uniform before she and Ben are hunted down by a cult that wants to cleanse all life from the planet, and believes her power provides the means to do so. While fighting to survive the cult’s increasingly violent recruitment attempts, the pair must battle dust devils, navigate a maze of mystical sewers, face down trash golems—and scrub the occasional toilet. Okay. Let’s see which of my boxes this book ticks straight off the bat. Urban Fantasy? Tick. Unique premise? Well, I can’t recall reading any other books about supernatural cleaning agencies, so that’s a tick. Clever writing that balances witty snark with some gag humour, with a healthy dose of action Double tick. Well, we’re off to a flying start here! If I had to choose something to compare Enter the Janitor to for the purposes of recommendation, the closest I could come would be Simon R. Green’s Nightside and Secret Histories series. They share certain superficial similarities of premise, such as the modern setting with a secret world within it. The Nightside and the Secret History novels have the titular Nightside and the paranormal community that the Drood family polices, respectively, while Enter the Janitors introduces the Cleaners, a supernatural sanitation agency that fight to maintain the balance between Purity and Scum (apparently there is such a thing as being too clean). They also share a very comedic bent to their writing style, as well as throwing some disturbing elements into the mix. 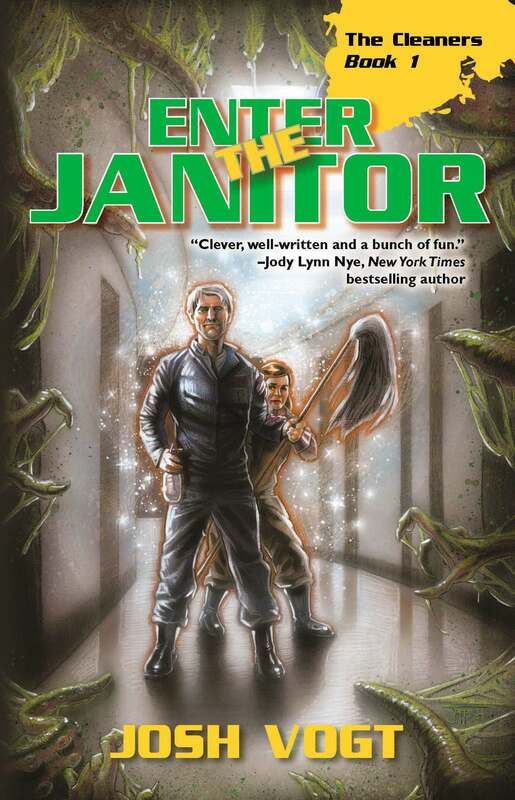 So if you’re a fan of Simon R. Green’s work, you’ll probably find a lot to enjoy here, but that’s not to say that Enter the Janitor doesn’t have its own unique charm. It most definitely does. For me, stories live and die on their characters, at least in general, and I think one of the strongest points of Josh’s writing is his character development. His work in Forge of Ashes made me seriously think about my perceptions of some very common elements of traditional fantasy, and got me genuinely invested into the character’s stories. While I don’t think there’s anything quite that mind-blowing in The Cleaners for me, the characters still had more than enough pop to them that I found myself becoming attached to them, rooting for their victories and feeling worried when things weren’t looking so good. I won’t go into detail about all of the characters, but I figure a run-down of our heroes is in order at least. We’ll start with Ben, the grizzled old Janitor (with a definite capital J). Gruff, and prone to being blunt, he’s nonetheless a good-natured soul who just wants to do what he can before he’s, uh, forced into “retirement”. I don’t want to spoil anything here, but there’s a lot of pain and sorrow in his life, and the knock-on effects of it have cast a shadow over his position in the Cleaners. He looks at training Dani as his last big task before he’s done. There’s a couple of really endearing habits he’s got that made me immediately fall in love with the character, specifically his refusal to stop trying to find ways around the magical profanity filter his employers have put in place to stop their agents from swearing (apparently it’s bad for the image if servants of Purity are foul-mouthed) and his continual malapropisms (using a similar sounding word with a different meaning in conversation, leading to humorous results) while trying to explain situations to Dani. I’m not convinced the malapropisms are unintentional, and that’s something I find utterly amusing, since it’s the kind of thing I’d do. Dani on the other hand is a medical student with a severe phobia of germs and dirt, terrified beyond belief of illness. She compulsively cleans herself with anti-bacterial gels, can’t stand to be touched, and is, initially at least, repulsed by Ben. She gets herself caught up in Ben’s work early on, and is revealed to be a Catalyst, a rare kind of magic user with some seriously strong control over the elements. Being a Catalyst is enough to get her conscripted into the Cleaners, and so she finds herself thrown into a world she had no idea existed, with Ben as her mentor. She’s highly strung, difficult to deal with, and very unhappy with her situation, but she makes the best of a bad lot. I’ll admit I found Dani a little annoying at first, though I suspect that was an intentional effort when writing her, but I warmed to her quickly as she learned the ropes of being a Cleaner and began to accept what was happening. She plays off Ben really well, and once they start to trust and respect each other, the story really comes to life. Unfortunately I don’t think there’s a whole lot more I can really say about the novel without spoiling too much of it, I know I normally don’t shy away from doing really in-depth reviews, but this is one instance where I honestly feel you’re better off going in relatively cold to experience it properly. There’s twists and turns, and it took me a lot longer than normal to really figure out what was going on (this is a good thing, normally I can call the plot resolution very early in a story). So to finish it off, all I’ll say is that I highly recommend checking this out, particularly if you’re a fan of urban fantasy and comedic literature. Josh’s writing is on point and does exactly what it needs to in order to get you sucked into the story without wasting time on unnecessary exposition and flowery language (not that I dislike exposition and flowery language, but in a novel like this I think the fast, punchy pace of it is ideal). I can’t wait to read the sequel. Written while listening to Tool. Pretty much the whole discography. Took me a while despite being shorter than most of my reviews. Next post from me will be another chapter of A Fistful of Roses. Before that goes up though, there’s another post from Professor Jimbles coming soon, and Evan may have something ready to go. Either way the next post from someone will be up within the next week. This entry was posted in Fiction, Reviews and Playtests and tagged Fantasy, Fiction, Josh Vogt, modern fantasy, Review, The Cleaners, urban fantasy. Bookmark the permalink.